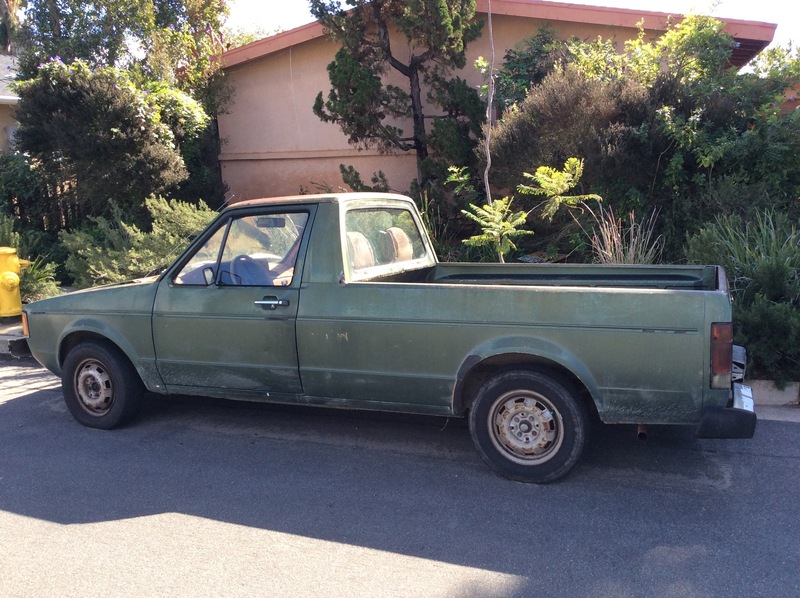 It is time for my beloved truck, my 1981 VW Rabbit Pickup Truck, Baraka Joe, to be put out to pasture. We have been together since 1985, when I bought him, used, for $3000, as my very first car. He has carried me across the country from college in Maine to California, and has carried countless loads of compost and mulch, manure and straw bales since. 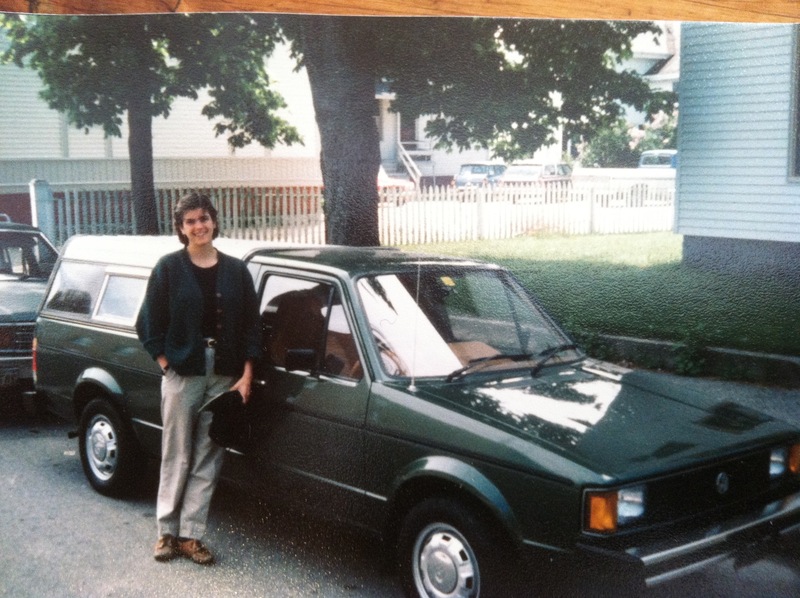 He has carried me slowly, loudly — he is a diesel — and economically (45 miles per gallon!) to every job I had, every class I took, until I had kids. Then he became the second car, the utility vehicle. As a manual — i.e. stick shift — he has been zippy and fun to drive. As he has aged, he has slowly lost his looks. He is loud and smelly. 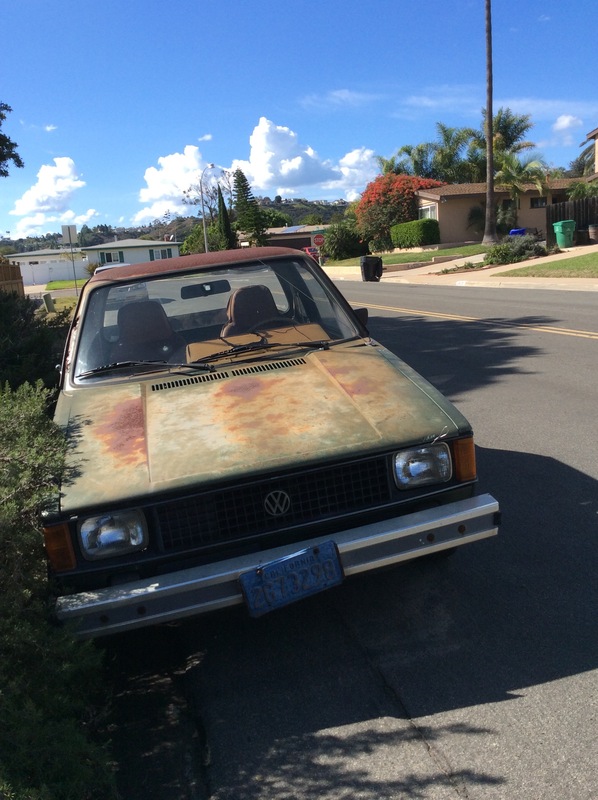 He has no ceiling, just bare metal, and cracked seats and dashboard. His odometer stopped working at about 250,000 miles. Some days, his speedometer sticks and I have to judge my speed by the cars around me. I have to unhook his battery every time I stop, as there is a short somewhere that will drain the battery. I have kept him alive all these years out of pure love. I LOVE to drive this truck. Last week, Baraka Joe nearly killed me when the hood latch fell apart on the freeway and the hood slammed up into the windshield. Fortunately, no one was around me, and I was able to safely pull over. It’s time to say good-bye. I will miss this car so much! I love not buying gas very often. I love carrying wood and greenery to the dump and coming back with compost and mulch. I love shifting into 2nd, 3rd, 4th, listening to the rum-hummmm of the engine, and downshifting to slow down, my seat the perfect distance from the pedals. Baraka Joe has never been in a hurry. That’s how he acquired his name, from a Swahili Proverb. Having such a long relationship with a car, with an object, is kind of a metaphor for what I value in life: taking care of what I have; keeping friends for a long, long time; going slow and seeing the blessings all around me. Thank you, Baraka. Asante sana. I let my garden go fallow this summer. The drought and blistering heat made gardening feel like more of a chore and guilt-trap than a joy. But now that the weather is cooling off and rain is coming (!!!) I am tackling the issue I gave up on at the end of last season: gophers. Last season, they eluded my traps, and ate everything in sight. Rather than build raised beds, like many of my neighbors, I am experimenting with protecting my in-ground beds with hardware cloth. 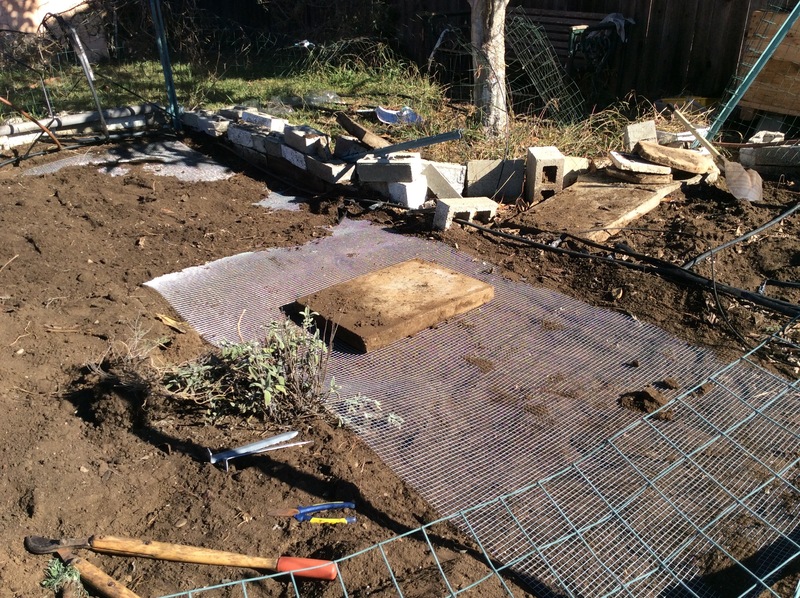 I down in the dirt, raised up the sides of my recycled cement-block beds, and laid down the mesh. Next, I’m burying the mesh in 1.5 feet of new and old soil and compost. Then, it’s time to plant and re-install the drip irrigation! Oh, the things we do for our plants! This morning, on my Sunday morning swim at La Jolla Cove, about 1/2 mile from shore, I saw hundreds of fish schooling in a circle. the circle was about 20 feet in diameter, and the fish were running on a race track about 10 feet wide. The fish themselves were long — 24 ” or so — and torpedo-shaped, sliver with small, dark stripes on their sides, like bars. I looked them up when I returned, and I believe they were young California Barracuda. 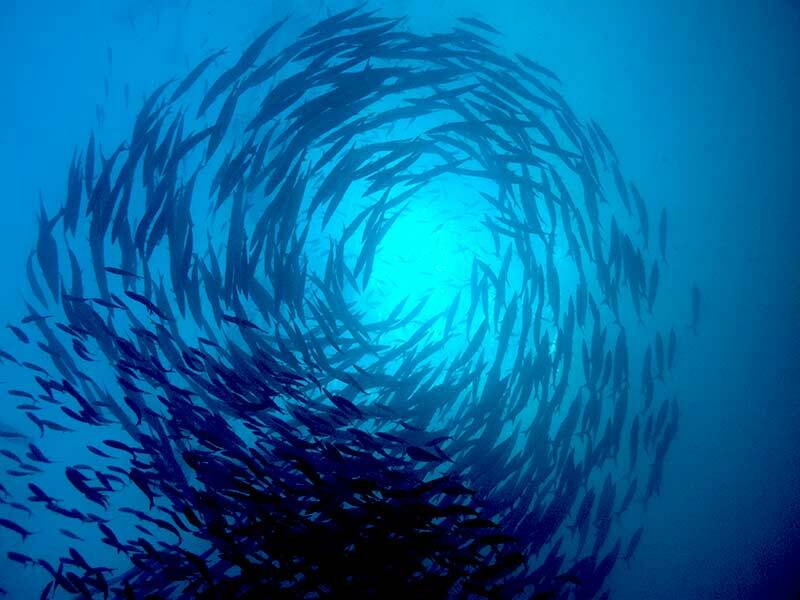 Here’s a link to a photo of barracuda schooling in the way that I saw: http://www.divemastercourses.com/wp-content/gallery/fauna-flora/Barracuda-school-circle.jpg.